First Chair takes inspiration from its musical neighbors—Berklee College of Music and Symphony Hall. By Catherine Cray	| Arts & Entertainment	| August 16, 2016, 3:08 p.m.
Berklee College of Music and Symphony Hall define the Fenway as Boston’s musical center. So, when the Fenway Civic Association began nearly a decade-long project of restoring a small park nestled in the center of the neighborhood, highlighting the environment’s natural music was a priority. A piece of public art seemed the perfect way to do that. Enter Jacob Kulin. Kulin is a contemporary sculptor with a passion for sleek, Scandinavian furniture design, who eschews the literal and instead infuses his conceptual designs with details from a variety of influences. When entering the design process, his goal was simple. 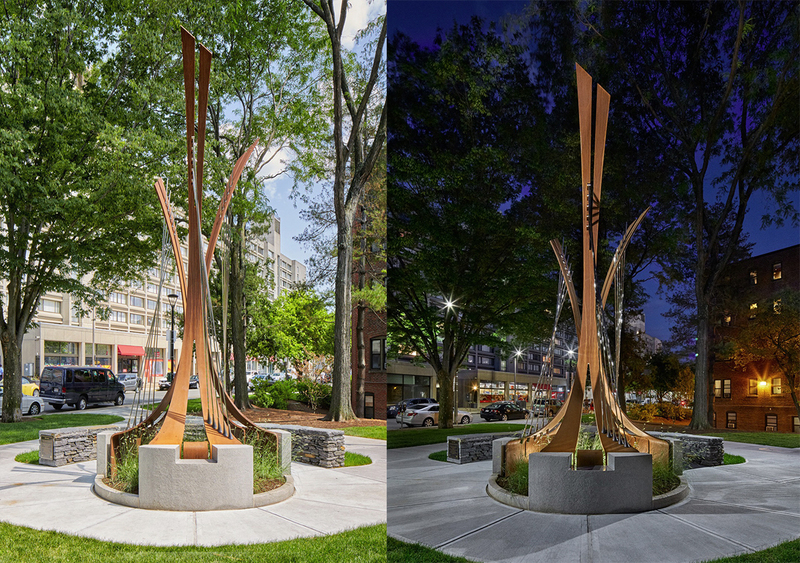 “I need to create a sculpture that’s going to make someone walk into the park, something that by night, when they’re walking by, they see this glow and wonder ‘What is that? '” he says. So, rather than create a large replica of a specific instrument, like a violin, Kulin aimed to create a piece that hinted indirectly at music. “If you look some of the dimensions and lines on the sculpture itself, you’ll see that I’m abstractly taking from symphonic music and instruments,” Kulin explains. He studied the shapes of instruments like the harp and the cello, and of musical symbols like the treble clef to create a sculpture that evokes thoughts about music in its broader sense. Indeed, walking by this 16-foot sculpture, you might expect it to burst into song. “I have these vertical forms that are supposed to create tension, visual and physical tension, because that’s what you find on a lot of musical instruments.” But don’t get your hopes up. “I wanted the piece to look as if it could make a sound, but unfortunately, because of the budget, it can’t,” Kulin says. The landscape of the rest of Symphony Park is part of this music as well, and Kulin worked with architect John Pate to enhance the natural symphony of the two parts. Kulin says that in some ways the park is a horizontal reflection of the vertical sculpture, with the sleek horizontal lines of the walls and benches mimicking the rounded lines of the sculpture’s steel and cast bronze vertical beams. He thanks the influence of Scandinavian furniture for this harmony, specifically the wishbone chair by Hans Wegner, the lounge chair by Poul Kjaerholm, and the harp chair by Jorgen Hovelskov. The chairs’ sleek shapes and sweeping lines both reflect the musical instruments and lend the sculpture a sense of balance. The design also has a personal resonance for Kulin. “My mother’s Danish, so there’s been this love for Scandinavian design throughout my life, and I have a love of furniture-making,” he says. Because of his deep personal investment, Kulin resisted pressure from his clients, and waited until he had a feeling for the sculpture as a whole to select a title. Ultimately, he decided on First Chair, which is a musical term designating the leader of an instrument section in an orchestra. “Not only is my sculpture taking on this symphonic, abstract attitude, but it is also a chair. At the base of each of the three forms, there is a seat,” Kulin explains. In this way, the name is a play on words, a happy mélange of both the Scandinavian seating and the symphonic music that inspired the design.